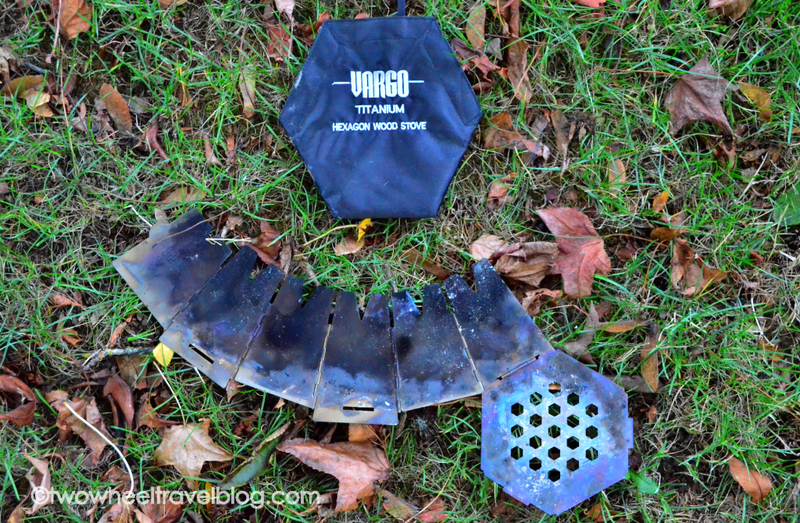 About 6 weeks ago the Vargo Titanium Hexagon Stove landed on our doorstep here in Portland. Since then, we have used it on 3 separate overnight bike camping trips, and one 3 day back country gravel romp around Mt. Hood. The compact elegant design of the stove makes it super smooth and easy to use on ultralight bikepacking adventures and even extended multi-day bike tours. 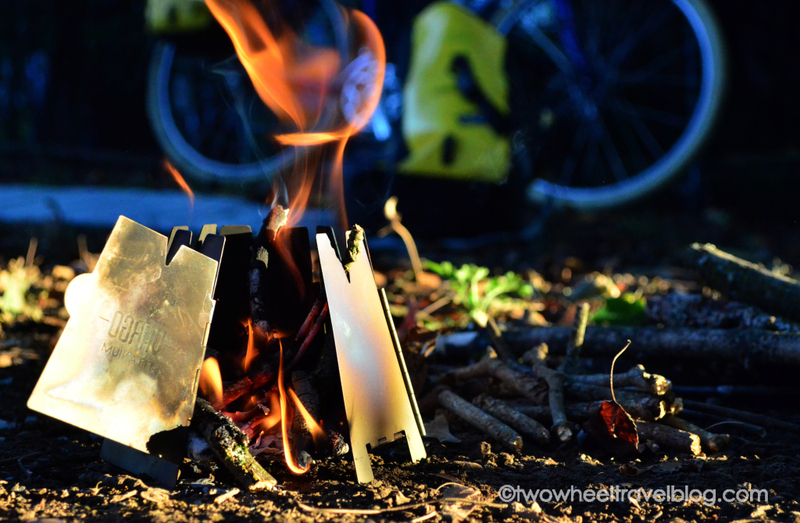 Previously our bike touring kitchen has consisted of the standard isobutane propane burner stove. Even with the ultralight versions we’ve been using the past couple of years, there is still the challenge of finding the right canister to fit the stove. It seems, when you have the “screw-in” can, everyone is selling “puncture” cans, and vice-versa. In Israel and the Southern Balkans we struggled to find canisters to fit our MSR. It would have been great to simply gather wood and start a fire. The first thing everyone wants to know is the weight of the stove. Yes, titanium construction means that it is light, 116g to be exact. Although when compared to the MSR Pocket Rocket, our previous burner, the weight is pretty similar. So, what gives? First, the MSR weight is stove only, add in a fuel canister and you’re carrying 2 or 3 times more weight. Next, consider space. With fuel cans and stove, the MSR takes up a sizable chunk of space in frame bags or pannier. The compact and intuitive storage design of the Vargo takes about as much space as a folded map. The Vargo neatly folds accordion style, nesting in a flat carrying pouch that is it easy to stash inside panniers, frame bags or even a hydration pack. Unfolding is equally simple. Remove the stove from its pouch and wrap the panels around the stove’s base, making sure to fix the two retainer tabs into the stove walls. 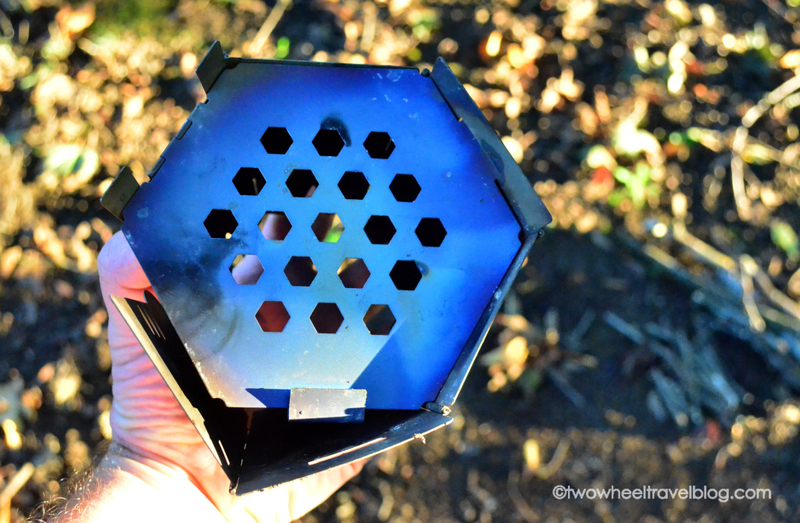 Although featherweight, the Vargo Hexagon Wood Stove is plenty durable. The titanium construction resists twisting and bending when stowed inside panniers, and feels solid in the hand. Once assembled, using the stove is fairly straightforward. Starting with small, dry fuel and slowly building to a larger fire takes about 5-8 minutes. The vented bottom and the chimney top draw airflow through the stove, quickly turning the smallest spark into flame. Using the hinged side door as a damper, the fire’s intensity and temperature are easily controlled. The conical shape focusses the stove’s heat rather effectively, and the narrow chimney top holds a small (less than 1.5l) pot very nicely. The Vargo works best with single entree type meals, boiling 1 l of water in about 10 minutes. Being from rainy Oregon, we’ve learned from experience: it’s best to bring along light, compact tinder, like dry cardboard shavings, dryer lint or similar as a fire starter (Your milage may vary depending on climate and pyro-ability). Still, the Vargo starts like a champ. Even in rainy weather. Our first attempt at using the stove was met with a bit of poor planning on my part. Neglecting to gather a small stash of dry tinder before departing on a quick overnight trip to Bagby Hot Springs, an early season thunder storm left all forage-able kindling thoroughly soaked. Fortunately we were able to find something burnable, and a fire was sparked. The next few burns went without a hitch. Boiling water for coffee in the morning, and making noodles at the end of a long day. And recently when we suddenly found ourselves doused in a bone chilling Mt. Hood rain shower, we used the Vargo as a quick trail side fire pit to warm frozen fingers and roast a sausage or two. The key is starting small, with tiny twigs, shavings or dry tinder stash and slowly working up to larger pieces about 3-4″ long and 3/4″ – 1″ thick. It’s tempting to pack the stove too quickly at first, in a rush to get a raging fire burning. The only area of improvement we would like to see is taller legs to allow more room for ash build up and airflow. But this can be remedied by digging out a small divot in the ground, beneath the stove, before sparking a flame. 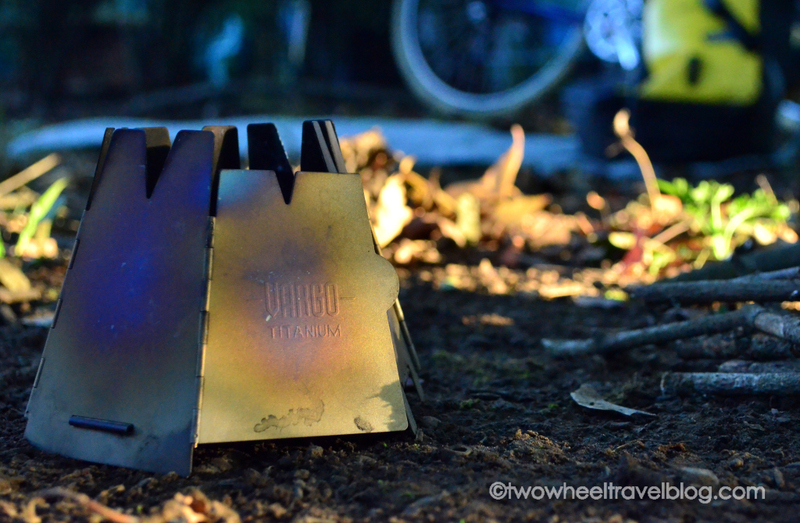 As a bicycle tourist, The Vargo Titanium Hexagon Wood Stove will serve you well. Use it. If you want to save space in your bags and cash in your wallet ( no more cans to buy!). Full disclosure: This product was provided to us by Vargo Outdoors for our review and analysis. All opinions are our own. 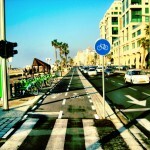 If you or your company have a product that you think would be beneficial for bicycle tourists and bike travel, please Contact Us, we’d be happy to talk to you.